Christian Assistance Bridge relies on generous donations of church partners, company businesses and faithful community members. Your gift of any amount is a blessing. Each box of food and/or utility assistance we provide gives our volunteers the opportunities to pray with and share the love of God with a family in crisis. Make a donation online thru paypal by clicking here. Enroll in Kroger Community Rewards and help CAB every time your shop. Login and add Community Assistance Bridge as your charity! 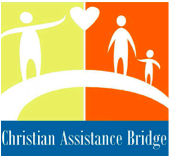 Help Christian Assistance Bridge today by adding us to your amazon smile account. Every time you shop, Amazon gives money to CAB. 2) Navigate at the top of any page, and then select the option to Change your Charity. Or, from your mobile browser, select Change your Charity from the options at the bottom of the page. 3) Select Christian Assistance Bridge to support. * $36.45 will feed 15 families in need. * $72.90 will feed 30 families in need. * $150.00 will help keep the lights on for a family in crisis. * $250.00 will help families in crisis not lose their home. Your gift of any amount is a blessing. Helped 11 families keep a roof over their heads.